An ally of his exiled pro-independence predecessor, Carles Puigdemont, Torra was elected after three other politicians were disqualified by the central government and has attempted to rebuild communication that has lapsed after the unsanctioned independence referendum in October 2017. Last month, for the first time since 2016, the head of the national government, the Socialist Pedro Sanchez, who himself only assumed his post in June, and the Catalonian leader met face-to-face. “We had an opportunity to sit around the table and talk about EVERYTHING. This is a good starting point. We agreed that this is a political issue that should be solved politically,” Torra told Salmond, during a sit-down interview. But Torra is expecting Sanchez, who leads a minority party and has predicted that the Catalan crisis may take the best part of a decade to resolve legally, to make the next move. “Now we will see facts from the Spanish government and we will be there to talk about everything,” said Torra, who was himself elected by a margin of a single vote. While Torra has toned down the strong separatist rhetoric he deployed while out of office, a stumbling block remains before any long-term resolution, in the form of charges against the referendum organizers, several of whom he symbolically named to his government. 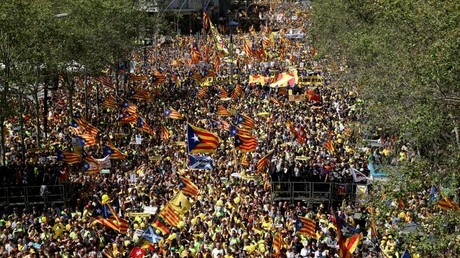 “There are political prisoners in jail in Spain. Democratic politicians that only wanted to let the Catalans vote and now are in prison. People in exile. 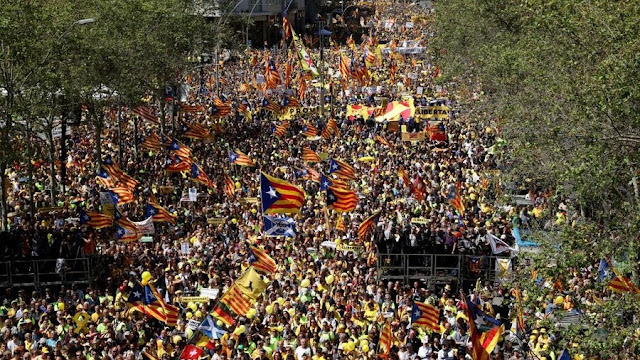 Thousands of Catalans being prosecuted and investigated by Spanish politicians. We are living in a very critical moment,” he told Salmond. “We think that they should be free tonight, this evening. We are not negotiating this – if we negotiate their freedom, we are admitting that they are in prison for some reason,” argued Torra. The 55-year-old believes that the democratic springwell of Catalonia can serve as an example to the rest of the country and, in the longer term, Madrid and Barcelona will become capitals of two republics with a “fraternal” relationship. While Salmond, the one-time leader of Scotland’s independence movement, maintained a neutral tone through the interview, he couldn’t but help signal his support to a man with a similar cause, presenting him with a traditional Scottish quaich – a toasting cup – at the end of the interview.